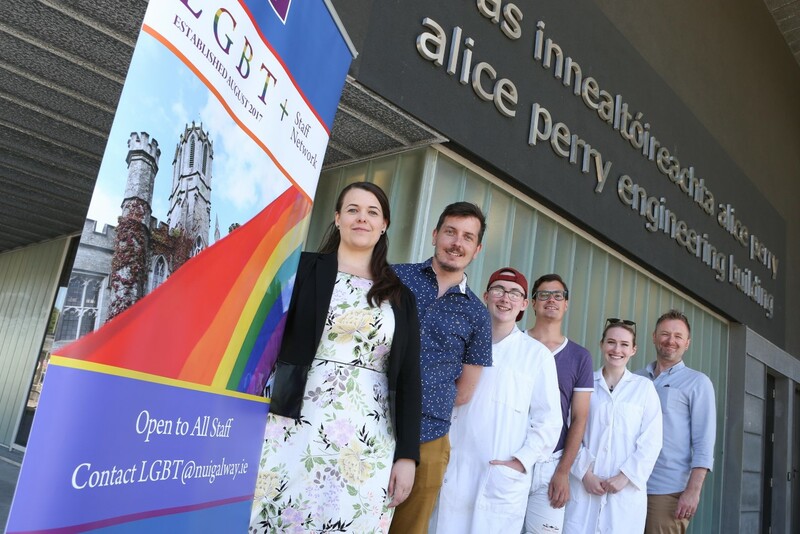 To celebrate the first ever International LGBT+ STEM Day, members from the LGBT+ Network in NUI Galway will host a number of events on campus on Thursday, 5 July, to demonstrate its commitment to supporting its staff and students who are members of the LGBT+ community and who significantly contribute to the University’s STEM (Science, Technology, Engineering, Mathematics) disciplines. “The NUI Galway LGBT+ Staff Network is committed to creating a safe and inclusive environment for staff of all sexual identities and genders at the University and to advocate for and raise awareness of LGBT+ issues. It is well documented that staff and students within the STEM disciplines face added difficulty in being out compared to those in other disciplines and we are proud to support International LGBT+ STEM Day and House of STEM, an Irish-based network dedicated to connecting and supporting LGBT+ scientists in Ireland. Dr David McNamara, Co-chair of LGBT+ Staff Network and lecturer in Earth and Ocean Sciences, NUI Galway. David is a structural geologist whose research mainly focuses on energy and mineral resources with the aim of assisting in their sustainable and environmental extraction to work towards decarbonisation of our society. He recently returned to Ireland after seven years researching energy in New Zealand. Cameron Keighron, LGBT+ Network Steering Committee member and Masters student in Regenerative Medicine, NUI Galway. NUI Galway over the last number of years, most notable the D1 Now study, which aims to improve health outcomes for young adults with Type 1 Diabetes. He is a member of the LGBT+ Staff network steering group and the Vice Chairperson of AMACH! LGBT. Talk title: Queering entrepreneurship: starting up in a toxic startup world. Togán Labs is a boutique open source software development and consulting firm specialising in the Internet of Things. It was set up in Cork by Aoife and Elizabeth in 2016. Steve is a Gaymer who moved to Galway from Glasgow in 2011 to work in the gaming industry. Dr Stefaan W. Verbruggen, Marie Skłodowska-Curie Research Fellow at Queen Mary University of London. Talk title: A window on the womb: how strong is a baby’s kick? Dr Stefaan W. Verbruggen is currently based in the Department of Biomedical Engineering at Columbia University, New York where his research focuses on the mechanobiology of cancer, and how it metastasises to bone from other areas of the body. Prior to his fellowship, Dr Verbruggen conducted his PhD research in the Biomechanics Research Centre at NUI Galway, followed by postdoctoral research in the Developmental Biomechanics Lab at Imperial College London. Professor Ciarán Ó hÓgartaigh, President of NUI Galway will open LGBT+ STEM Day in the Alice Perry Engineering Building at 1pm on Thursday, 5 July and events will take place directly afterwards.